“You should have won the first prize!”, said the first prize winner to us, personally, like the majority of mentalists, who realized what incredible effects we had accomplished and who have an idea about the effort, work and dedication behind our illusions. So should I complain? I do not. And here is why. First of all, because the winner was completely different in every aspect and hard to compare to us. He showed a prediction effect instead of mind-reading and his presentation was more in the direction of comedy. I don’t envy the judges who have to compare such different acts! In all honesty, I have to tell you that even without the winner, we would not have had enough points this time for a first place. Unlike last year at the European Championships, where we received 80 out of 100 possible points, we received less points this time, although we felt that our act improved a lot since then. Second, I know from experience that winning doesn’t change your life as much as placing 2nd or 3rd doesn’t. Show producers still request a video of your act, not an award diploma. My only worry is that we couldn’t perform at the winners gala, where only the first prize winners of all 8 categories are competing against each other for the title of the Grand Prix-Winner. There are even more potential clients or recommenders watching. In the end we should get a video of our performance, so everything fine with that as well. The first prize winner also runs a Spanish TV station and invited us to perform there. For the development of our career (in the Spanish market) this may be more important than running up behind him in a competition. Third, because the conditions for us were excellent. Other than 3 years ago, where almost everything went wrong for us before we even entered the stage, in Busan we not only had the perfect slot as the last mentalist act on Thursday, we were even allowed to use a projected background, which is not a standard. Participating as the current European Champions we were, of course, one of the favorites to win. So why didn’t we? 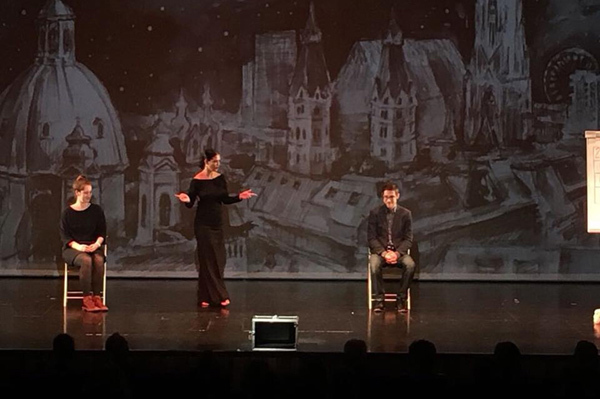 For the last thirty seconds of our act, accompanying the revelation of the first love of a random spectator, we had added a levitation effect to it. Anca rose up about 30 centimeters. Although this is clearly not a mental effect, we thought it would boost the entertainment value of our act. It was also a kind of disclaimer, that we are still magicians and NOT psychics or mediums. It completely backfired. Almost all judges and other magicians felt that it was not only unnecessary, but even counterproductive because it was distracting and, among other disadvantages, didn’t allow Anca to walk freely around the stage in the 9 minutes up tp that point. I fully agree that watching Anca walking can be way more magical than a rather insignificant rise. We kicked the effect out the same evening and if we would have made it to the winners gala, we would have already performed without it. We had this idea for more than 4 years and only in May we discovered a rather simple way how to do it, so we developed this levitation only for the FISM World Championships of Magic and, I must admit, it was a risk. But no risk, no fun, right? One final note on this. The idea itself is not a bad one, but then Anca would have to float like David Copperfield. We don’t have the resources yet, but who knows about the future? The second reason was that we showed too much magic. Way too much. We bombarded the judges with one impossible effect after the other. What takes 25 minutes in our theatre show, we squeezed into 10 minutes, the maximum length at FISM. After seeing 90 acts before us, I can’t blame the jury for missing details of our performance, even more because none of the judges was a mentalist. On the contrary, I have the highest respect for the level of concentration that they must uphold during such a competition. My suggestion would be to have separate, specialized juries for each category, but that is a different, general subject. The stage jury gave way more importance to the presentation than to the magical content. 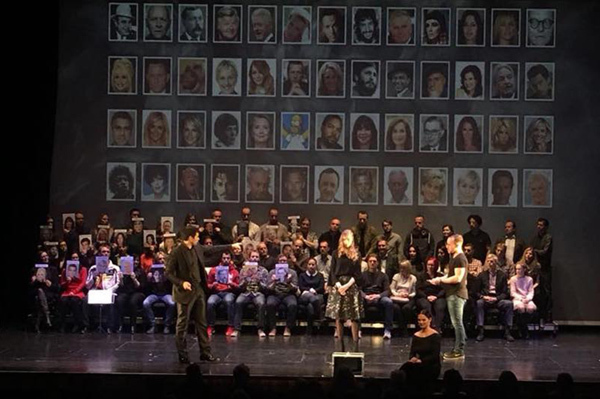 As much as this was a disadvantage in the competition, their personal feedback after the competition was extraordinarily helpful for the improvement of our act and show for lay audiences. We could have made it easy for ourselves, thinking that we do that anyway in our public shows. Instead, we let the feedback of the judges and other influential thinkers in our field trigger a thought process in us. Since then, we have already developed a complete new presentation idea that we will already show at our next booking. It could bring our presentation to the same level as our magic. What better can you bring back home from a competition? Three years ago I was very much focused on winning the competition and very upset about the factors that didn’t even allow us to do so. Since then I’ve learned that the real value of a competition is the qualified feedback and the connections you make. 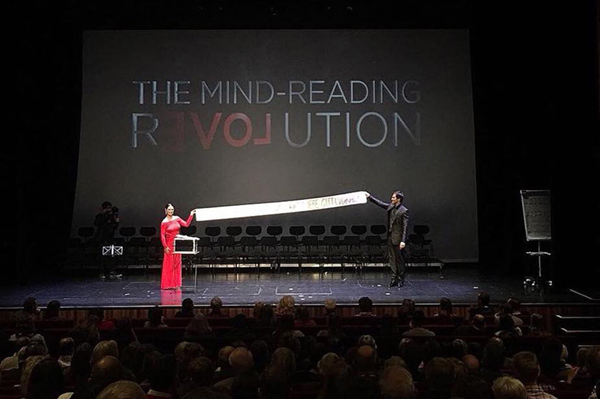 We’ve made new friends and are both more motivated and certain more than ever that our Mind-Reading Revolution will change not only our life but even those of others who watch it for the better in the future. So if you are a young magician reading these lines, my advice to you is to enter competitions in order to develop your act. Don’t get discouraged if you don’t get an awards, don’t stop developing, if you do. 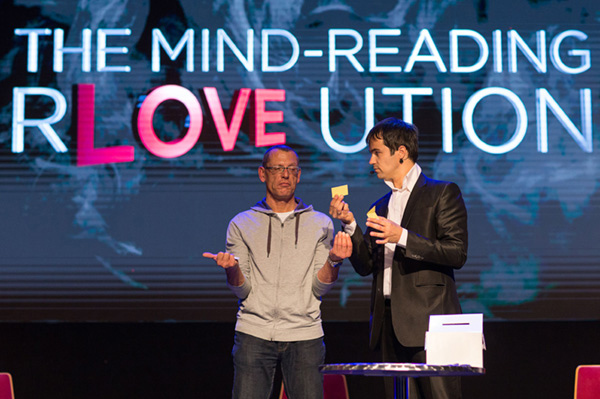 The feedback of some of the world’s most experienced and successful magicians in the audience is invaluable and hard to get somewhere else. They may not even give you the answers, but they will ask the right questions. In the end, if you want to create something that has never been done before, it will more than not, come from within you! 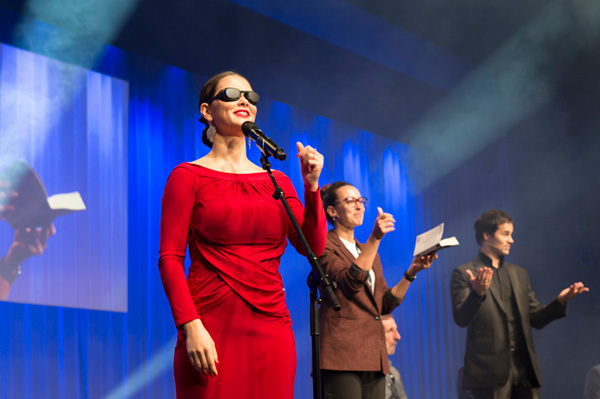 At the official World Championships, which take place every three years and this time in Busan/South Korea, we have successfully repeated our title of Vice-World Champion of Mental Magic and have been ranked as the best mind-reading act by the jury. The married couple, Anca & Lucca, are second to none. After studying magicians and self-proclaimed mediums, they started to develop their own methods for their demonstrations of mind-reading, clairvoyance and premonition. Using little more than their awareness, sharpened perception and power of their mind, no simple explanations could be given. Their vow not to use cheap tricks such as prearrangements, actors, or hidden electronic communication devices makes it hard to believe their claim of not having supernatural powers. Are mind-reading and clairvoyance real? Or is is just an illusion and can be explained? 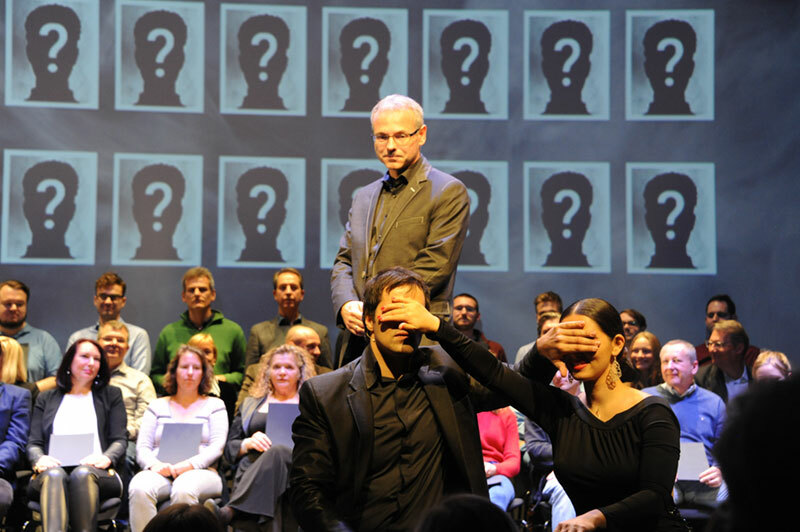 In their theater show, Anca & Lucca reveal the secrets of mental magic and leave you speechless and amazed nonetheless. The spectators become part of the newest and unsurpassed illusions of mental magic. At your next event, you want to give your audience something to talk about for years. An experience that will fascinate and connect the most fastidious guests, who have seen almost everything else. 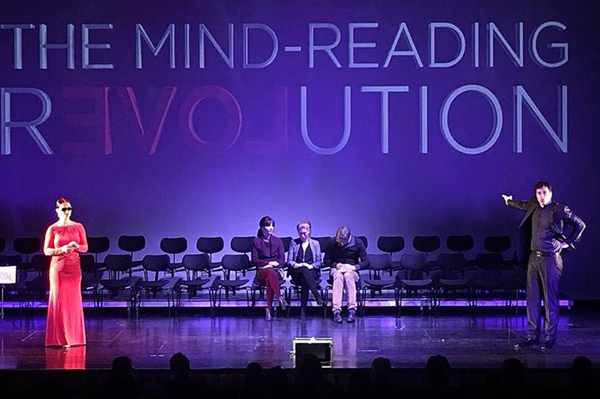 The Mind-Reading Revolution can be performed almost anywhere with almost no set-up time and no more stage equipment than a few chairs or a flipchart at most. It is uncomplicated and a pleasure to work together with Anca & Lucca, who utilize their experience to get the most out of their act for your event. In a high-tech world like ours and with an act so seemingly impossible, the suspected use of hidden cameras, headphones or other electronical signalling devices is apparent. Anca & Lucca rule out such methods and signed an affidavit to prove it. if you can prove that Anca and Lucca use pre-arrangements, confederates or any kind of hidden electronic communication device. They never did - they never will. The Austrian Lucca has been performing magic for 20 years and became a professional illusionist and speaker in 2008. 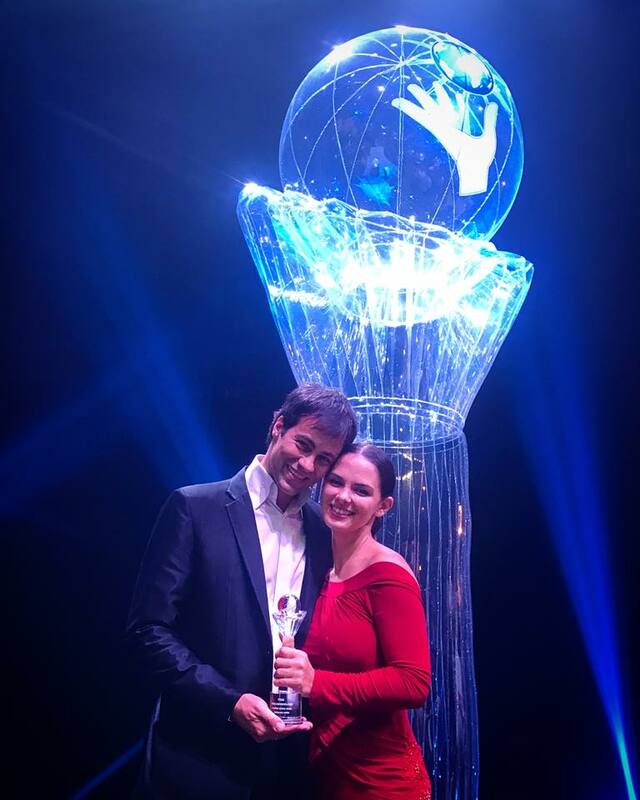 Romanian-born Anca was not introduced to magic before marrying Lucca, but had a comprehensive stage experience as a ballroom dancer since her earliest childhood. In 2012 Anca & Lucca started re-designing and re-inventing the illusion of mind-reading and clairvoyance. Ever since, they've been constantly pushing the boundaries of their art and try to make their performances more entertaining and intriguing even for those who didn't like magic before. 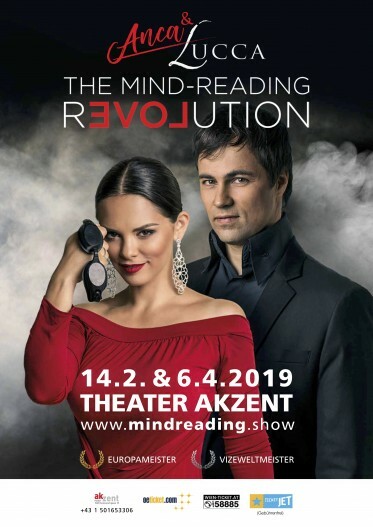 For TV-Shows “The Mind-Reading Revolution” offers a variety of new schow-acts and illusions, never seen on international television before. Anca & Lucca continuously develop new illusions, worldwide unique in their impossibility and perfection. Contact them for more information! Floria Lucian - Anca & Lucca Mental Magic e.U. Lucca Lucian - Anca & Lucca Mental Magic e.U.